As we walked through Wal-Mart tonight, I pointed out things to Tristan like I always do. I said there's a truck to which he said, "cuck!" I asked him if he said truck and he said cuck again. We were playing with his See and Say and mom asked him where the duck was. He pointed at the duck and quacked! Then she asked where the dog was and he pointed at it and barked! I'm waiting for him to start saying Momma again. It was the first thing he said, but then a couple months later he just stopped. On Sunday Katelyn asked him where his daddy was (on the family picture) he pointed at Tyler. She asked him where I was in the picture and he turned around and looked at me sitting on the couch. The point being, he knows who I am. I just wish he would say it. 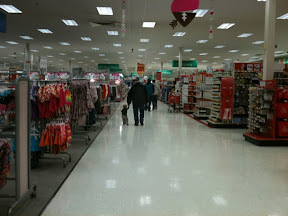 Here he is walking through Target with my dad. Isn't this SO CUTE?! ?